It's just an exhibition, but the 2018-19 Pacers season is officially underway. Indiana went into Houston and came away with a 110-100 win in their preseason opener on Thursday night. "It was our first test," Pacers head coach Nate McMillan said after the win. "Conditioning we know we have to get better. We did a lot of good things, and we did some things that we have to work on." All-Star guard Victor Oladipo helped get Indiana off to a fast start, scoring five early points as the Blue & Gold opened the preseason with a 12-3 run. Indiana remained in front until the 2:48 mark in the first quarter, when Eric Gordon's layup gave Houston its first lead of the night. The two teams went back and forth for the rest of the first half, which featured seven ties and six lead changes but ended with the Pacers in front. Oladipo picked up where he left off last season, leading all scorers with 19 points on 7-of-13 shooting and pulling down three rebounds. He even had a little luck on his side, banking in a three as the halftime buzzer sounded to give Indiana a six-point lead. The Pacers came out of the locker room on fire, rolling off a 14-4 run in the opening minutes of the third quarter. But they cooled off considerably shortly thereafter, going without a field goal for just under seven minutes. Houston took advantage of that slump, outscoring Indiana 23-2 over that span to move back in front. Bojan Bogdanovic provided some much-needed momentum at the end of the quarter, knocking down a deep three at the buzzer to give the Pacers an 83-82 lead heading into the fourth. Edmond Sumner and TJ Leaf, a pair of second-year players who were solid all night for Indiana, got the Pacers going in the final frame. Sumner scored six straight points and Leaf added a 3-pointer as Indiana opened up the fourth quarter with an 11-4 run. The Pacers maintained a double-digit lead for almost the rest of the night. Houston did manage to trim the deficit to six with 1:11 remaining, but the Blue & Gold handled their business at the free throw line to seal the victory. Oladipo scored 24 points in as many minutes to lead all scorers, going 9-for-18 from the field and 4-for-10 from 3-point range. Leaf, starting at power forward in place of Thaddeus Young (out with a minor foot injury), added 13 points, 12 rebounds, four assists, and two steals. Domantas Sabonis also recorded a double-double with 15 points and 12 rebounds, while Cory Joseph chipped in 14. Sumner, who played in just one NBA game as a rookie on a two-way contract, impressed on Thursday. Getting rotation minutes in place of Tyreke Evans (sore ankle), Sumner tallied 13 points on 6-of-8 shooting, two rebounds, and two steals. 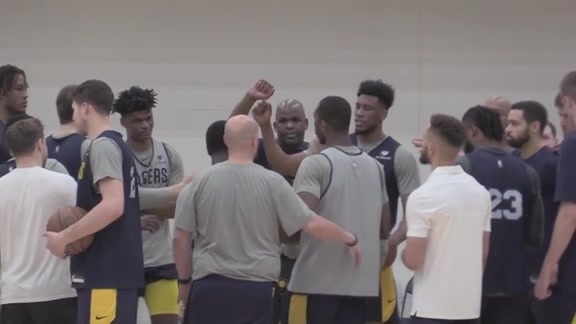 "The biggest thing we wanted to do was first of all go against some other competition, as we've been beating each other up for that past week and half," Pacers center Myles Turner said. "It was good to see some guys get out there and get some running. TJ played great, Sumner did great." Reigning NBA MVP James Harden led Houston with 17 points and 10 assists in the loss. Carmelo Anthony added 16 points, going 6-for-9 from the field and 4-for-6 from beyond the arc. The Pacers will head to Memphis on Saturday for their second preseason contest. Indiana is set to square off with Mike Conley and the Grizzlies at 8:00 PM ET. Pacers coach Nate McMillan has said he wants the Pacers to be a better rebounding squad than they were a year ago and the early results are promising. Indiana outrebounded the Rockets 48-41 and 13-7 on the offensive glass. Seven of Leaf's 12 rebounds came on the offensive glass. Were this a regular season game, Leaf would have doubled his previous career high for rebounds. His best rebounding game as a rookie came on Jan. 6 vs. Chicago, when he pulled down six boards. Turner had 11 points on 4-of-9 shooting, five rebounds, and two blocks in 21 minutes for Indiana. Sharpshooter Doug McDermott was the only one of Indiana's three offseason signings to play on Thursday and he struggled to find a rhythm. McDermott was on the floor for 35:45, but managed just two points on 1-of-8 shooting (0-of-4 from 3-point range). As might be expected in the preseason, both teams were sloppy with the ball on Thursday. The Pacers forced Houston into 26 turnovers, but had 21 giveaways themselves. 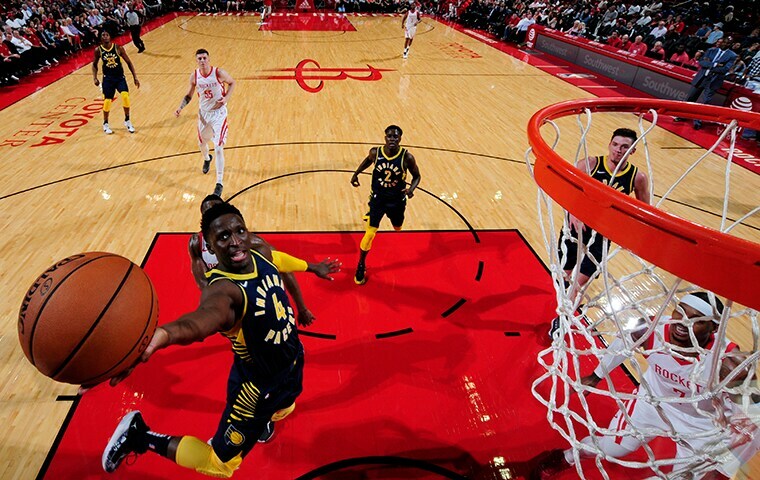 The Pacers outscored the Rockets by 25 points when Leaf was on the floor on Thursday. Only one other starter had a positive plus-minus: Darren Collison at +3. Rookie Aaron Holiday, the 23rd overall pick in the 2018 NBA Draft, played the final 5:34 on Thursday for the Pacers. He missed his only field goal attempt, but went 3-for-4 from the free throw line. Veteran center Kyle O'Quinn, another of Indiana's free agent signings this summer, dressed but did not play against the Rockets. Former North Central High School and Indiana University standout Eric Gordon had 12 points and four rebounds off the bench for Houston. Indiana travels to Memphis to take on the Grizzlies on Saturday, Oct. 6 at 8:00 PM ET.